Today’s global food industry is offering a variety of generous opportunities as well as fierce competition. According to the U.S. Bureau of Labor Statistics for 2016 – 2017 employment of chefs and head cooks is projected to grow 10 percent from 2016 to 2026, faster than the average for all occupations. Most job opportunities for chefs and head cooks are expected to be in food services, including restaurants. Euromonitor puts the global consumer food-service business–everything from cafés and fast-food chains to full-service restaurants–at $1.85 trillion. But with many restaurants operating on a cash basis, even in the U.S., the true value of this industry is hard to pin down. Despite these difficulties in measuring the absolute size of the food business, nearly everyone agrees: this sector is growing at an astonishing pace. Clearly, there is a great need for professionals who have the expertise and business knowledge to identify, market, and develop profitable business enterprises in the food industry. Our degree provides a firm foundation in culinary techniques, leadership, management knowledge/skills and entrepreneurial know-how in order to allow TASTE Academy’s graduates to build a successful career in this thriving industry. Locate the stage you should be at, make your personal plan and take advantage of the opportunities offered by the School. 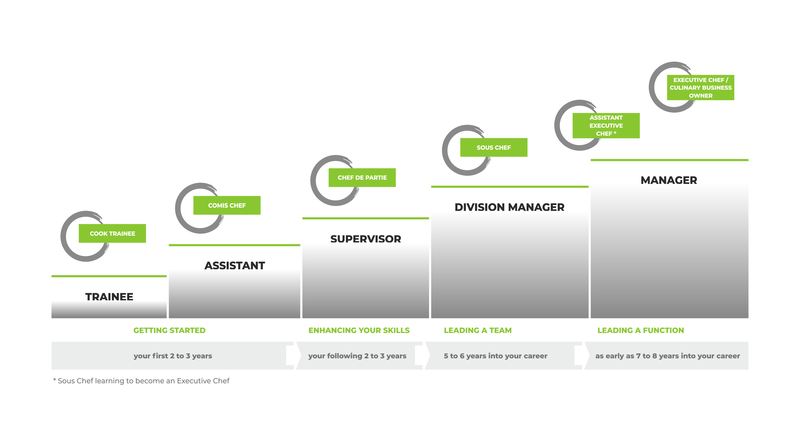 Find below a typical example of a career ladder for the position of Executive Chef/ Culinary Business Owner. Depending on your dream career and where you see yourself working, the steps of the ladder can change. Career opportunities in the Food Industry are various in type and can be pursued after graduating this program, depending on the student’s individual needs, skills and personality. We offer personalized career coaching to help you advance your career, through the designated career team in the Student Services Office.